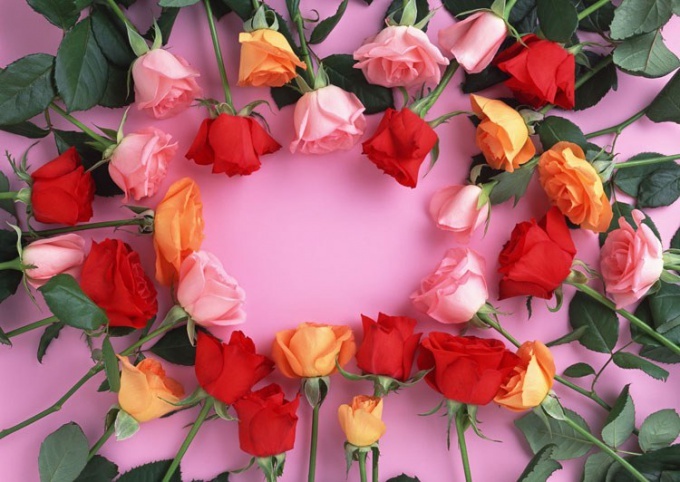 The life of cut roses is rather short, and reasons to that are numerous: blockage of flowers air bubbles, dehydration plants and reducing sugar in the tissues of the flower. After a few days the flowers begin to fade, losing its beauty. In order to keep the flowers fresh for long time to please you with its aroma, it is necessary to observe a few simple rules that will help to protect the Queen of flowers - rose. Buying roses on their own on the market, pay special attention to the degree of expansion of buds. If you want in this case to preserve the flowers for a long time, that they please your eyes with their presence and beauty, then the rose buds must be open, but well developed. Once you brought home the roses, inspect them carefully, but do not rush to put them right in the water. Wet a clean kitchen towel or any cloth cut in a fairly cool water and place in a dark, cool place. Many flower sellers are advised to put the roses in the refrigerator at 5 degrees, where for three hours they need to get used to his new "life". Prepare the vase that will stand the bouquet. Her need to wash and fill the already-settled water. Add tablet of activated charcoal, aspirin, and a small amount of sugar. Aspirin is quite well tolerated flowers, and coal will help to disinfect the water. Sugar will serve as an excellent nourishment for plants. Before you put the roses in a vase with water, you should prepare the flowers. To do this, take the roses and put the stems under a stream of cool water. Make a slanting cut with a sharp razor (in any case, not scissors) in the water, it is necessary to tubule is not clogged air tubes, and drank water. The stems in the lower part, smash a bit with a hammer. Without removing the flowers from the water, cut the thorns and leaves in the lower parts of the flowers, so they do not touch the water. Thus, the water in the vase will not rot. Can add a special preservative that can be purchased at almost any flower shop. Now you can safely put a bouquet of roses in a vase. At night you can put flowers in the tub with cool water, before it refresh slicers with blades. This bath helps to revive the flowers, and then in the morning they will look like they just took a shortcut. Regularly check the bouquet, if necessary, add some fresh pooled water (but not tap, as it contains air bubbles). Daily change the water in a vase as tainted water leads to a rapid withering of roses. Do not place the composition in close proximity to heating devices and direct sunlight. And spraying the bouquet of roses will help to preserve its freshness and aroma.